Tony Cingrani has been very good to start 2018. So far, he’s definitely been the Dodgers best reliever. He’s pitched all of seven innings so it’s hard to make any real strong claims right now, but he’s posted a 2.57 ERA, 0.57 WHIP, 1.48 FIP, and a 0.71 xFIP. Opponents are hitting just .160 against him. He’s faced 25 batters, and struck out 12 of them (48% strikeout rate), while walking none. On the young season, that puts him 21st in FIP, fourth in xFIP, 11th in WHIP, and eighth in strikeout rate. It seems it all has to do with him relying on his slider more like he did in last year after the Dodgers acquired him. With the Reds in 2017, he threw 89.3% fastballs, 8.6% changeups, and 2.1% sliders. He had essentially given up on the slider. He also posted his lowest walk percentage in his career over this stint (6.1%) but was still getting hit really hard with nine home runs allowed over 23.1 innings. Those two correlate because a fastball is the easiest pitch to throw for a strike, and also the easiest for most hitters to hit. Hitters want fastballs. He threw first pitch fastballs almost 96% of the time, and 98% of the time when the batter was ahead. Hitting a 95 MPH fastball is probably incredibly difficult — I’ve never done it. 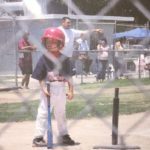 However, if you’re a professional batter and you’re also 98% sure you’re going to see a fastball, it’s probably easier. 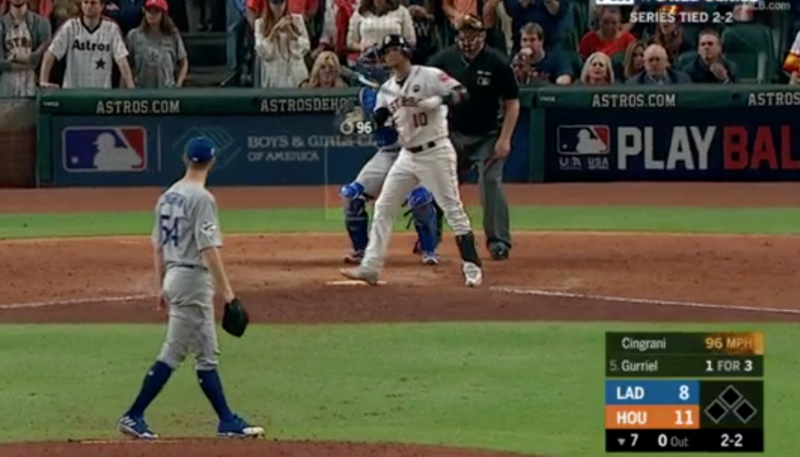 The Houston Astros seemed to do well when they knew what pitches were coming. Too soon? Even with the change in usage, Cingrani was seventh of 192 relievers with at least 40 IP in fastball usage in 2017. He would have finished significantly higher if not for the Dodgers acquiring him. Over his previous two seasons, he ranked fourth in back-to-back years in fastball usage. Throwing fastballs often is fine if it’s an elite offering. Pitchers should throw their best stuff as often as they can. 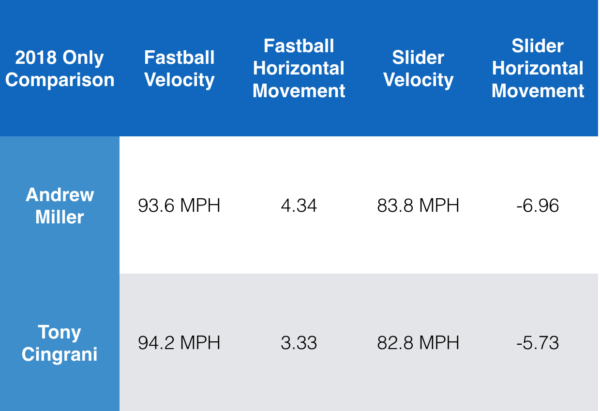 However, the issue here is that Cingrani throws a regular 4-seam fastball, whereas all the other guys who throw “fastballs” as often have significant movement — think Kenley Jansen‘s cutter and Scott Alexander or Zach Britton sinkers. This year, he’s throwing only 67.8% fastballs, which is his career low, paired with a career high in slider usage at 31.3%. He’s also pretty much ditched his changeup, which is good. Of all qualified relievers he’s 43rd of 159 in slider usage this year, which is a very welcoming trend, because it seems to be what unlocked him. When the Dodgers acquired Cingrani, he had a 5.40 ERA, 1.33 WHIP, 7.01 FIP, and a 24.2% strikeout rate over 23.1 innings. In his 19.1 innings for the Dodgers, Cingrani posted a 2.79 ERA, 1.09 WHIP, 1.86 FIP, with a 36.4% strikeout rate. He was worth 0.6 fWAR over that stretch — effectively a two win reliever over a full season, of which there were only 12 in 2017. This year, in a handful of ways, he profiles similarly to Indians relief ace Andrew Miller. I’m not saying he’s going to be Miller or anything like that, but with a few offseason changes it looks like he profiles similarly to him now. 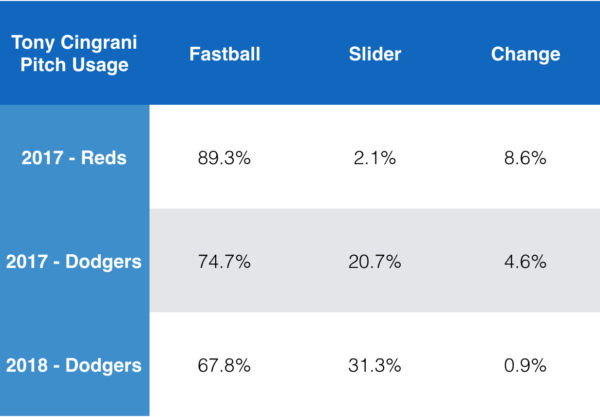 Miller still gets more drop on his slider than Cingrani does, but Miller might have the best slider in the game. Regardless, it’s not a bad mold to take. His fastball and slider both look slightly different than they have in the past. His horizontal fastball movement with the Dodgers last year was 5.3 inches, and so far it’s 3.3 which would be a career low. This means that the fastball used to run away from right handed hitters 5.3 inches on average, and now it’s running away less. His slider ran in on right handed hitters 1.6 inches last year, and is now running 5.7 inches, which is tenth in the league in horizontal movement. That is phenomenal, as almost all wipeout sliders have this kind of run. It looks like this new movement stems from a slightly altered arm angle, as his vertical release point has dropped down slightly, and his horizontal release point has shifted out to his left more. However, with such a small sample size I don’t want to get too much into this, as he could just be positioned on a different part of the mound. If it keeps up, we’ll dive into it more in the future when he has more innings under his belt. Either way, he’s getting way more whiffs overall, both on the fastball and the slider. They probably play well off each other. With the Dodgers last year he got 12.3% whiffs on the fastball, and 21% whiffs on the slider. This year he’s at 20.5% on the fastball, and 27.7% of the slider. Overall, that puts him at fourth in whiff rate overall (22.6%), trailing only Edwin Diaz, Carl Edwards Jr. and Josh Hader. You can only say so much about seven innings, although it’s been a very strong, promising seven innings for Cingrani.